JavaFX Scenic View 1.2.0 now available for download! 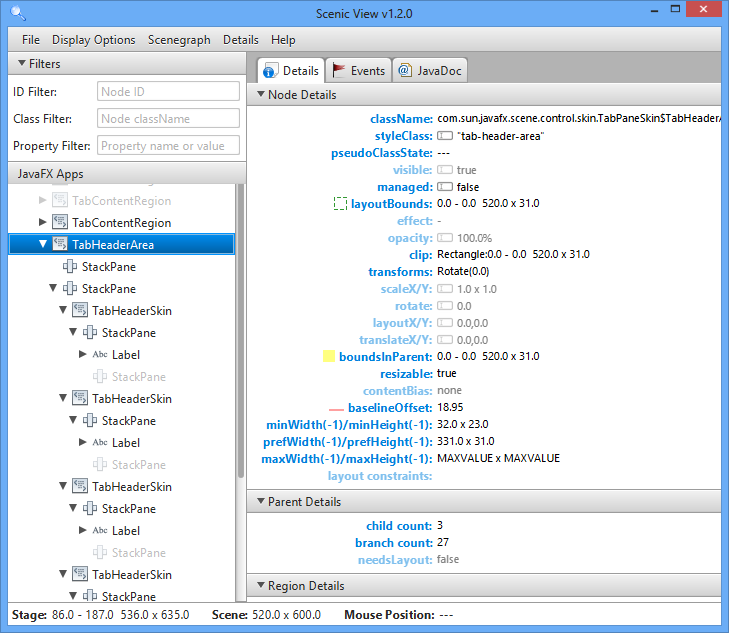 It is with great pride that Ander Ruiz and I announce the release of Scenic View 1.2.0. This release includes a bunch of new features, most notable of which are support for event monitoring, javadoc browsing, contextual menus (to minimise UI clutter), support for copying details to the system clipboard, and a bunch of bug fixes (particularly around tools.jar / attach.dll requirements). As always, the download can be grabbed from here, and you can read the help documentation to learn about all the features. Can you tell me how you created the window frame? This looks great! Wow, this release has lots of great new features, you even added event tracing with a filtered log view 🙂 Thanks! I can’t get this version to work on WinXP, JDK 7, though I have had it working in the past. It runs and shows its UI but it can’t see any other FX apps. For info I’m using build 1.7.0_09-b05 on WinXP 32-bit. I just downloaded and retried. The file I’ve got is 928,766 bytes long and is dated 26/09/2012 09:59. Could you have another ScenicView.jar in the classpath of the monitored application? I forgot to say that I use ubuntu 12.04, and scenic view works fine for my own javafx applications.